For some people, writing comes naturally and they truly love doing it. For others, it is an arduous task that they avoid and do so only when necessary or required. No matter why you write though, the best way to get your point across whenever you are writing, is to make sure your writing is done effectively. These 6 awesome tips for effective writing can greatly assist you in doing that. Whether you are a student in high school or in college, knowing the different types of writing techniques available to you is very important. When it comes to learning and using effective writing skills, avoiding common errors is essential. Writing a term paper or any kind of writing task can be very challenging. However, there are several effective writing strategies that can make it much more easier for you to accomplish your work. These six great effective writing strategies for college students, high school students or anyone simply trying to write better, are very useful. We have even included some effective writing examples below. One of the first things a writer must learn about good effective writing techniques is avoiding vagueness. Effective writing means using concrete sentences and structures. When writing effectively, a writer must be clear in his or her communication to the reading audience. Conciseness and brevity, are also essential. Here are some examples of writing effectively and writing vaguely. Vague Writing: Sally did not like the jeans her sister gave her. One of the problems with this sentence is that it raises more questions than it provides answers. Why didn’t Sally like the jeans? And why did her sister give them to her in the first place? Concrete Writing: Sally did not like the jeans her sister gave her as a birthday gift. They were too baggy and loose. Vague Writing: People are complaining about the extreme weather in the East Coast. Again, questions about the weather need to be answered here which are not. What made the weather extreme? When did the extreme weather take place? Lastly, in what part of the east coast did the extreme weather occur? Concrete Writing: The residents of New York city had nothing but complaints this week about the really hot weather. No matter what you decide to do in life, to get better at it, you must practice. The same goes for writing effectively. Taking time to practice writing each day can make a huge difference as times goes on. 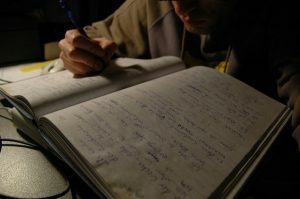 Most experts agree that using at least twenty minutes a day to write and practice are highly recommended. As with everything you do, the more you practice, the better you will get at it. Another tip to remember for writing effectively is to avoid overusing certain phrases or terms. Words such as ‘it was,’ ‘there are,’ ‘there is,’ ‘it is,’ and others should be avoided. It doesn’t mean that you should not use these words or phrases when necessary. It just means that you should refrain from overusing them too many times to get your point across. Example: There is a killer on the loose as reported in the news. Effective Revision: A killer is on the loose according to news reports. One of the biggest mistakes people make when trying to write effectively is not doing proper research. Some end up using sites such as Wikipedia or other pages as their sources. But these sites are often filled with inaccurate information. That, in turn, can end up hurting how concrete your writing is. Do your research properly and smarter so that it will show on your work. A very important rule to remember when trying to implement effective writing techniques is using an active voice whenever possible. That means that you should refrain from using the alternative passive voice. By using active voice writing, you are telling the reader that the subject is carrying out the verb. On the other hand, the subject obtains the action when a passive voice is used. Passive Writing: The car was crashed and totaled. Active Writing: Amanda crashed and totaled the car. As you can see in the active voice example, we know who it was that crashed and totaled the car. Amanda was responsible for the action that the passive voice sentence failed to tell us. When it comes to knowing why is effective writing important, the answer is quite simple. Effective writing lets the author express his or her personality, beliefs and ideas. That will mean that it will vastly improve the communication between the author and reader. Maintaining control of your writing will ensure that you always write accurately and forcefully. The same goes for making sure your honesty, passion and emphasis are felt in your words. Being able to put these emotions and feelings into your writing will make your essay or paper that much better. ‹ Add vs. Ad – Which One To Use?